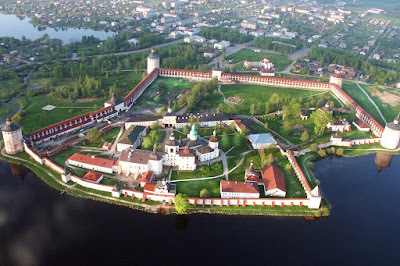 Saint Cyril, founder and abbot of White Lake Monastery (or Kirillo-Belozersky Monastery) in the present-day Vologda Oblast, and the largest monastery in Northern Russia, was born in Moscow in 1337 of pious parents and baptized with the name Kosmas. In his youth he was left an orphan and lived with his kinsman, the boyar (nobleman) Timothy Vasil’evich Vel’yaminov, in the surroundings of the court of the Great Prince Demetrius Donskoy (1363-1389). Secular life bored the youth. At the request of Stephen of Makhra (July 14), Kosmas was dismissed to the Simonov Monastery, where he took vows under Theodore (Nov. 28) with the name Cyril. Cyril fulfilled his monastic obediences under the guidance of the Elder Michael, who afterwards was Bishop of Smolensk. By night the Elder read the Psalter, and Cyril bowed making prostrations, but at the first ringing of the bell he went to Matins. He asked the Elder permission to partake of food every second or third day. The experienced Elder did not allow this, but blessed him instead to eat with the brethren, only not to the extent of satiety. Cyril carried out his obedience in the bakery: he carried water, chopped firewood, and distributed bread. When Saint Sergius of Radonezh came to the Simonov Monastery to see his nephew Theodore, he would seek Cyril in the bakery and converse with him about spiritual matters before seeing anyone else. They transferred Cyril from the bakery to the kitchen. He gazed into the burning fire and told himself, “Beware, Cyril, lest you fall into fire eternal.” Cyril toiled for nine years in the kitchen and God granted him such tender emotion, that he was not able to eat the bread he baked without tears, blessing the Lord. Fleeing the glory of man, he began to act as a Fool for Christ. As punishment for transgressing against propriety, the superior of the monastery placed him on bread and water for forty days. Cyril underwent this punishment with joy. But the Saint could not conceal his spirituality, and the experienced Elders understood him. Against his will they compelled him to accept ordination to the priesthood. When he was not serving in church, Cyril occupied himself with heavy work. When Theodore was made Archbishop of Rostov, the brethren chose Cyril as archimandrite of the monastery in 1388. Rich and important people began to visit the monk to hear his guidance. This disturbed the humble spirit of the Saint. Despite the entreaties of the brethren, he would not remain as abbot, but secluded himself in his former cell. Even here frequent visitors disturbed him, and he crossed over to old Simonovo. There at the desolate and sparsely populated White Lake, he found the place which he had seen in the vision. Saint Cyril and his companion Saint Therapon of White Lake and Mozhaisk (May 27), set up a cross and dug a cell in the ground near Mount Myaura at Siversk Lake. Saint Therapon soon went to another place, and Saint Cyril remained where he was. However, he was not able to live in his underground cell for even one year. Once Cyril, troubled by a strange dream, lay down to sleep under a pine tree, but just as he closed his eyes, he heard a voice cry, “Run, Cyril!” Cyril only just managed to jump away as the pine tree came crashing down. From this pine tree the ascetic made a cross. Another time Cyril nearly perished from flames and smoke when it cleared away the forest, but God preserved His saint. A certain peasant attempted to burn down the cell of the monk, but as much as he tried, he did not succeed. Then having repented with tears, he confessed his sin to Cyril, who tonsured him into monasticism. 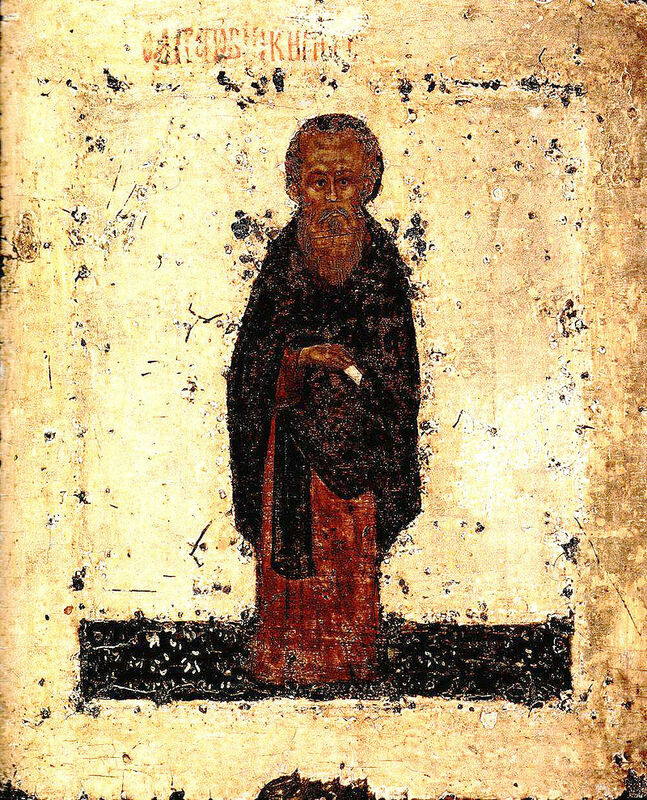 Two monks Cyril loved, Zebediah and Dionysius, came to him from Simonov Monastery, and then Nathanael, who afterwards was steward of the monastery. Many began to come to the monk seeking to be tonsured. The holy Elder perceived that his time of silence was ended. 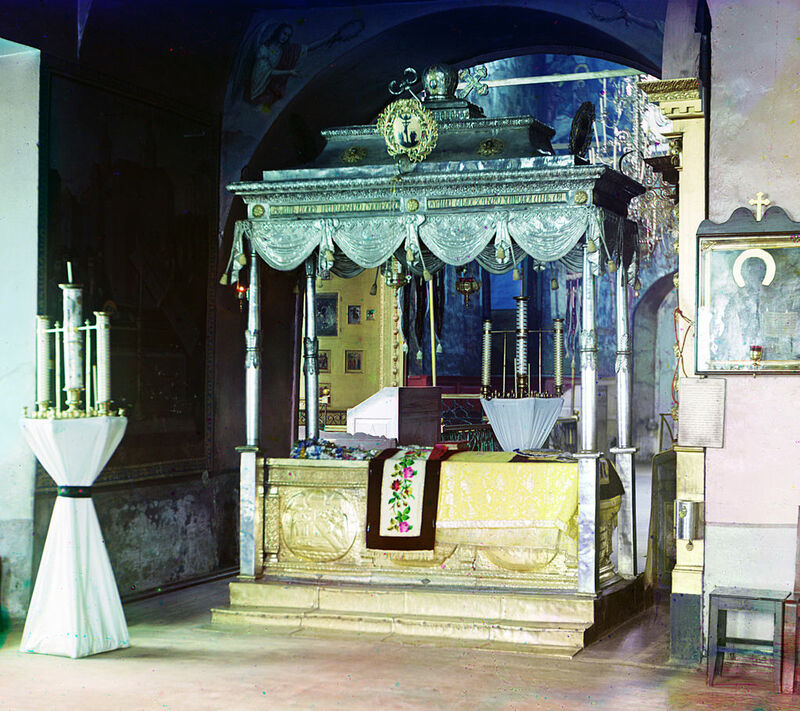 In the year 1397 he constructed a temple in honor of the Dormition of the Mother of God. When the number of brethren had multiplied, the monk gave the monastery a Rule of cenobitic life, which he sanctified by the example of his own life. Thus, no one could talk in church, and no one could leave before the end of services. They also came to venerate the Gospel according to seniority. At meals they sat each at their own place, and there was silence. From the trapeza, each went quietly to his own cell. No one was able to receive either letters or gifts without having shown them to Cyril, nor did anyone write a letter without his blessing. Money was kept in the monastery treasury, and no one had any personal possessions. They went to the trapeza even to drink water. The cells were not locked, and nothing was kept in them but icons and books. In the final years of Cyril’s life, the boyar Roman decided to give the monastery a village and sent the deed. Cyril knew that if the monastery came to possess a village, then the brethren would become concerned about the land, settlements would disrupt the monastic solitude, and so he refused the gift. The Lord rewarded His Saint with the gift of clairvoyance and healing. A certain Theodore desired to enter the monastery, but the enemy of mankind instilled in him such hatred for Cyril that he could not look at the Saint, nor listen to the sound of his voice. He approached Cyril’s cell and, seeing his grey hair, he was not able to say a word from shame. The Saint said to him, “Don’t be sad, my brother, for all are mistaken about me. You alone know the truth and my unworthiness. I am actually a worthless sinner.” Then Cyril blessed Theodore, promising that he would not be troubled by such thoughts in the future. From that time Theodore lived at peace in the monastery. One time there was no wine for Divine Liturgy, and the priest told the Saint about this. Cyril ordered a monk to bring him the empty wine vessel, which he opened full of wine. During a time of famine Cyril distributed bread to all the needy and he did not stop, even though the normal reserves hardly sufficed for the brethren. Despite this, the more bread was distributed, the more it increased. The monks then realized that God would provide for their needs, through the prayers of Cyril. The Saint calmed a storm on the lake which threatened the fishermen. He predicted that none of the brethren would die until after his death, despite a plague that would rage. Then many would follow after him. The Saint served his final Divine Liturgy on the day of Pentecost. Having giving final instructions to the brethren to preserve love among themselves, Cyril reposed in the ninetieth year of his life on June 9, 1427 on the feast day of his namesake Cyril, Archbishop of Alexandria. Within a year after the Saint’s death, more than thirty of the fifty-three brethren died. The monk often appeared to the survivors in dreams to offer advice and guidance. Cyril loved spiritual enlightenment and he instilled this love in his disciples. In 1635 there were more than two thousand books in the monastery, including twelve “of the Wonderworker Cyril” (among them there are 2 Gospels, 3 Canons, the "Ladder" by John of Sinai, Saint Dorotheos, Lives of the Saints, and also 4 collections containing information on natural science, medicine and recommendations on dietetics). Three letters of the monk to Russian princes survive down to our time. They are remarkable specimens of his spiritual instruction and guidance, love, love of peace and consolation. The veneration of the holy ascetic began not later than 1447-1448 and was officially canonized in 1547. The Life of Saint Cyril was commissioned by Metropolitan Theodosius and Great Prince Basil the Dark. 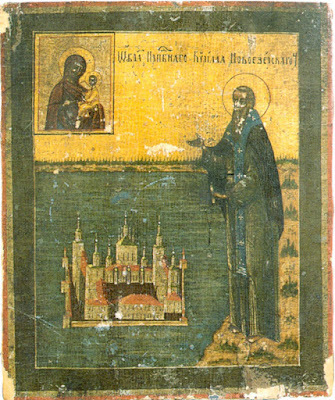 It was written by the Athonite monk Pachomios the Logothete, who dwelt at the Cyrilov Monastery in 1462 and met with many eyewitnesses and disciples of Cyril. He learned the most from Martinian (Jan. 12), who had lived with the Saint from his youth. 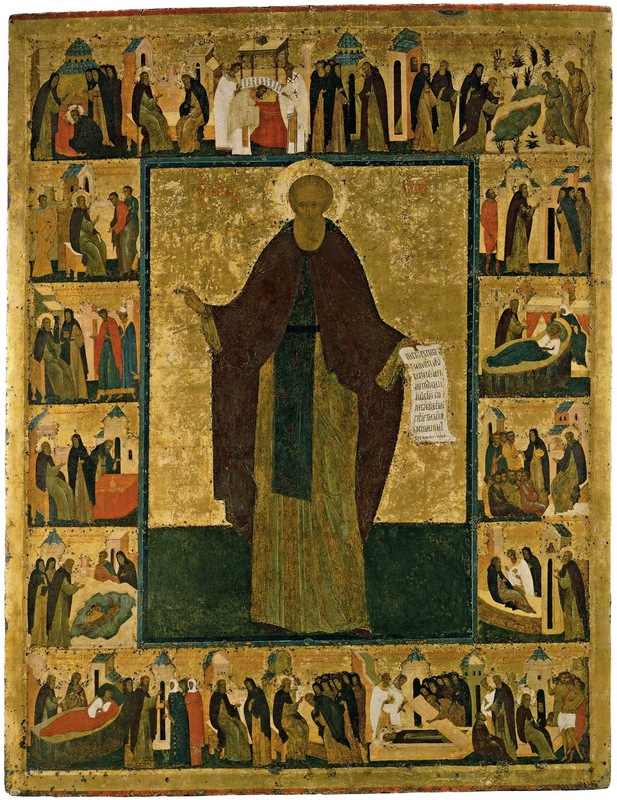 Dionysius Glushitsky painted the icon of the Monk Cyril of Belozersky during the lifetime of the Saint. 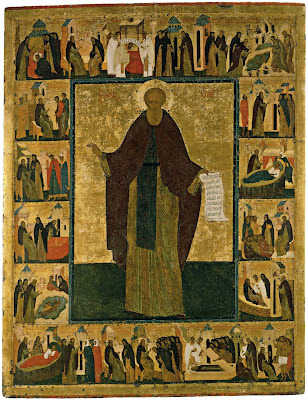 Thus, this icon, in a sense, is also the lifetime portrait of a Saint. 1424 (? ), the State Tretyakov Gallery. O Father Cyril, uprooting the thorns of passions, thou didst blossom as a lily in David's wilderness, where thou didst gather a multitude of disciples, and guide them as a father in the fear of God. Glory to Him Who has strengthened thee; glory to Him Who has crowned thee; glory to Him Who through thee works healings for all. Thou didst scorn all ways and thoughts which dragged thee down, and didst rejoice to yearn for the heavenward course. With the saints before the Trinity pray that thy flock may be preserved; for as we celebrate thy repose we cry to thee: Rejoice, O blessed Father Cyril.